Federal officers stopped a multinational human smuggling run off the Atlantic coast of Florida on Saturday. The smugglers were reportedly attempting to land 24 illegal aliens from six countries near West Palm Beach. 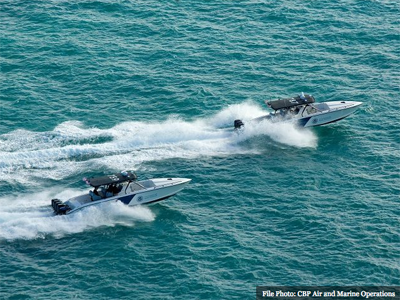 Marine crews from U.S. Customs and Border Protection’s (CBP) Air and Marine Operations (AMO) worked with the U.S. Coast Guard and Palm Beach County Sheriff’s Office to intercept a 25-foot center console boat off the eastern coast of Florida. The incident took place on Saturday about nine miles from West Palm Beach near the Lake Worth Inlet, according to information obtained from CBP. The marine interdiction agents stopped the boat being operated by a U.S. citizen and a Bahamian national. An investigation revealed the two were attempting to smuggle six Haitians, six Ecuadorians, four Chinese, three Bolivians, two Azerbaijanis, and one Dominican national. The effort to stop these human smugglers from bringing 24 illegal aliens into the U.S. involved a joint law enforcement effort from federal and local officials. CBP agents turned over all of the suspects in this incident to Homeland Security Investigations to determine appropriate charges for prosecution. Bob Price serves as associate editor and senior political news contributor for Breitbart Texas. He is a founding member of the Breitbart Texas team. Follow him on Twitter @BobPriceBBTX, Gab, and Facebook. Originally published on Breitbart Texas.